We just love this place! The food is consistently good, the staff is phenomenal, and the atmosphere is busy but relaxed. The atmosphere is very conducive to good conversation. We will continue making this part of our trips! I visited the Pink Pony on 1012/18 and loved it! We went around 6 so it was pretty busy but we got a seat right and the bar and had dinner and drinks there (the rum runners are great) I also enjoyed my french dip sandwich and my husband got whitefish tacos both were great. Our bartender was great he made good conversation with us. We also stopped in the store the guy and girl working were very friendly and helpful it had so many cute things. The hotel lobby also looked very nice next time we visit the island we plan to stay there. The fun pink drinks, superior staff, delish food, pink decor, ponies, awesome music, good vibes, pink seats, great views, fun people watching, pink bar, silly stories, nice gift shop, pink straws, nifty coasters, pink, pink, pink, pink, PINK!!!!!! I just finished the Great Turtle Trail Run and wanted to go into town to get something to eat. My best friend and I were having a hard time as everything was packed with other racers. We ended up at the Pink Pony that had 3 bars. The first 2 were packed so we tried the patio bar and what a hit! It was closed in but still cool with the weather. The heat lamps made it awesome! We had an amazing view of the lake. The staff said it was the last day open but they were still perfect. The food was so awesome also. We had never stopped in here before. We opted for a lake view table in the hotel, rather than the bar. The food was delicious. My husband had the flatbread with chicken and honey, and we both had soup, but I had the onion soup and half sandwich. Everything was excellent. Service was friendly and efficient, too. Busy, busy place with even busier bar scene, so if it’s dining you’re after, ask for a table in the hotel’s dining room overlooking the water. Our server was attentive, our menu choices just right. Every place on this island, particularly on the Main Street, will be more crowded than a New York subway, so adopt ‘island time,’ and wait at Pink Pony for a table. You’ll be glad you did! 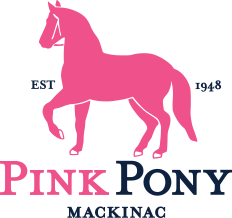 Being from Michigan, I have heard many people talk about the Pink Pony on Mackinaw Island. On a visit during Memorial Weekend, we decided to give it a try. The wait was approx. 1/2 hour for breakfast. Once seated, we were greeted quickly. The atmosphere was fun and making me want to visit at night, without kids. The food arrived fast and was delicious. Our view overlooked the bay, which was a bonus. I highly recommend giving them a try. This fall I had my first ever visit to the bliss from another era that is Mackinac Island. The Pony is in the epicenter of the downtown action with phenomenal water views from many tables. It is close by the ferry landing and is a “must visit” location either at the beginning, end or middle of your visit.